Kawhi Leonard received "MVP" chants during the Toronto Raptors' 113-101 win over the Boston Celtics but he thinks "it's a little too early". 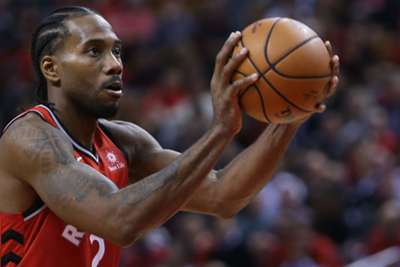 In just his second match since being acquired from the San Antonio Spurs, the 27-year-old forward scored 31 points and grabbed 10 rebounds in the Raptors' victory on Friday. Prior to shooting a free throw in the second half, Toronto fans aimed a chant at Leonard that he appreciated but thought was premature. "It's a little too early," Leonard said about the praise. "It's game two, but you know, I appreciate the support. I know they're excited about us winning the game to, and I appreciate it." Five Raptors players reached double figures and Toronto held Boston — the Eastern Conference favourites — to 40.4 per cent shooting from the field. However, Leonard still thinks there is room for improvement. "We played well and got stops when we needed to, I just felt like we could have done better," he said. "They got a lot of wide open looks. With a great team like that, they're not going to always miss it. They got a lot of second-chance points, as well, from us not rebounding the ball. "It's game two for us, you know, just something to build on and move forward with." Leonard has averaged 27.5 points and 11.5 rebounds in his first two games with the Raptors.